Accounting - is used to display monetary values with the default currency symbol and two decimal places. To apply another currency symbol or number of decimal places, follow the instructions below. Unlike the Currency format, the Accounting format aligns currency symbols by the left side of the cell, represents zero values as dashes and displays negative values in parentheses. Note: to quickly apply the Accounting format to the selected data, you can also click the Accounting style icon at the Home tab of the top toolbar and select the necessary currency symbol: one of the following currency symbols: $ Dollar, € Euro, £ Pound, ₽ Rouble, ¥ Yen. Currency - is used to display monetary values with the default currency symbol and two decimal places. To apply another currency symbol or number of decimal places, follow the instructions below. Unlike the Accounting format, the Currency format places a currency symbol directly before the first digit and displays negative values with the negative sign (-). Note: to quickly apply the percent style to your data you can also use the Percent style icon at the Home tab of the top toolbar. Fraction - is used to display the numbers as common fractions rather than decimals. Text - is used to display the numeric values as a plain text with as much precision as available. More formats - is used to customize the already applied number formats specifying additional parameters (see the description below). use the Decrease decimal icon situated at the Home tab of the top toolbar to display fewer digits after the decimal point. Note: to change a number format you can also use keyboard shortcuts. in the Number Format window that opens, adjust the available parameters. The options differ depending on the number format that is applied to the selected cells. You can use the Category list to change the number format. 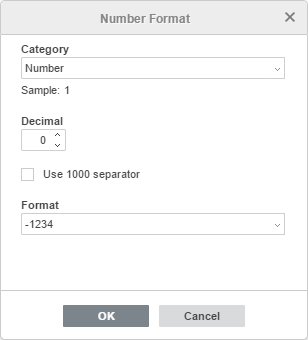 for the Number format, you can set the number of Decimal points, specify if you want to Use 1000 separator or not and choose one of the available Formats for displaying negative values. for the Scientific and Persentage formats, you can set the number of Decimal points. for the Accounting and Currency formats, you can set the number of Decimal points, choose one of the available currency Symbols and one of the available Formats for displaying negative values. for the Date format, you can select one of the available date formats: 4/15, 4/15/06, 04/15/06, 4/15/2006, 4/15/06 0:00, 4/15/06 12:00 AM, A, April 15 2006, 15-Apr, 15-Apr-06, Apr-06, April-06, A-06, 06-Apr, 15-Apr-2006, 2006-Apr-15, 06-Apr-15, 15/Apr, 15/Apr/06, Apr/06, April/06, A/06, 06/Apr, 15/Apr/2006, 2006/Apr/15, 06/Apr/15, 15 Apr, 15 Apr 06, Apr 06, April 06, A 06, 06 Apr, 15 Apr 2006, 2006 Apr 15, 06 Apr 15, 06/4/15, 06/04/15, 2006/4/15. for the Time format, you can select one of the available time formats: 12:48:58 PM, 12:48, 12:48 PM, 12:48:58, 48:57.6, 36:48:58.
for the Fraction format, you can select one of the available formats: Up to one digit (1/3), Up to two digits (12/25), Up to three digits (131/135), As halves (1/2), As fourths (2/4), As eighths (4/8), As sixteenths (8/16), As tenths (5/10) , As hundredths (50/100).